The Formula 1 cars were rushed back from Canada in time for the Italian Grand Prix a fortnight later. 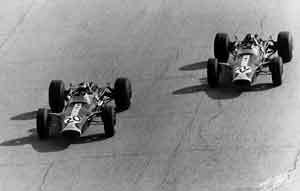 There were a few changes in the entry with the 1966 Italian GP winner Lodovico Scarfiotti having to find a drive in the second Eagle-Weslake as Ferrari continued to run only one car for Chris Amon. Honda had missed the Canadian event and that had given the team time to finish off its new RA300 chassis which had been built up at the Team Surtees headquarters in Slough. These had been set up the previous year to prepare a Lola T70 for the CanAm series and it was no surprise when the new Honda had a more than passing resemblance to the Lola Indianapolis car. It would later become known as the "Hondola". With Pedro Rodriguez still out of action after his Formula 2 crash at Enna, the Cooper team gave Formula 2 rising star Jacky Ickx a chance as Jochen Rindt's team mate. Team Lotus ran a third 43 for Giancarlo Baghetti. Pole position went as was now usual to the Lotus-DFV of Jim Clark although there remained problems of reliability for the Lotus. Jack Brabham's Brabham-Repco was alongside on the front row on the grid with Bruce McLaren's McLaren-BRM on the outside as the car was still new. The second row featured Amon and Dan Gurney's Eagle-Weslake while Denny Hulme shared row three Jackie Stewart's BRM and Graham Hill's Lotus. Brabham took the lead at the start but on the second lap Gurney went ahead followed by a fast-starting Hill, Clark, McLaren, Stewart and Hulme. By the end of the third lap Clark was in the lead and Hill moved to second place two laps later while Gurney disappeared with an engine failure. Hulme was giving chase and he passed both Lotuses to take the lead only to be pushed back to second by Clark soon afterwards. Then the Lotus driver hit trouble (as usual) and he had to pit with a flat tire. The Lotus driver was a lap behind when he rejoined. At the front Hill, Brabham and Hulme were switching places for several laps but then Hulme went out with engine trouble. Clark continued to drive a brilliant recovery and helped Hill to get away from Brabham with some slipstreaming work which also helped Clark catch those ahead of him. Clark was squaring up to pass the third-placed Surtees when Hill went out on lap 59 with an engine failure. Clark thus moved into second and gradually caught Brabham and took the lead - having made up a complete lap. Surtees was also able to pass Brabham and when Clark ran into fuel pump problems on the last lap Surtees and Brabham were able to get ahead again. Surtees thus gave the Hondola a debut victory. Brabham's second place gave his team a second consecutive Constructors' title and guaranteed that only he or Denny Hulme could win the Drivers' title.